HIGH VIZ - Sugar, Darling? Sometimes, you just need to wear something frivolous and fun. I'm very into the ruffle trend that is all over the high street at the moment, but depending on the fabric I've found that a lot of pieces just don't look great on me where the ruffles are too structured. 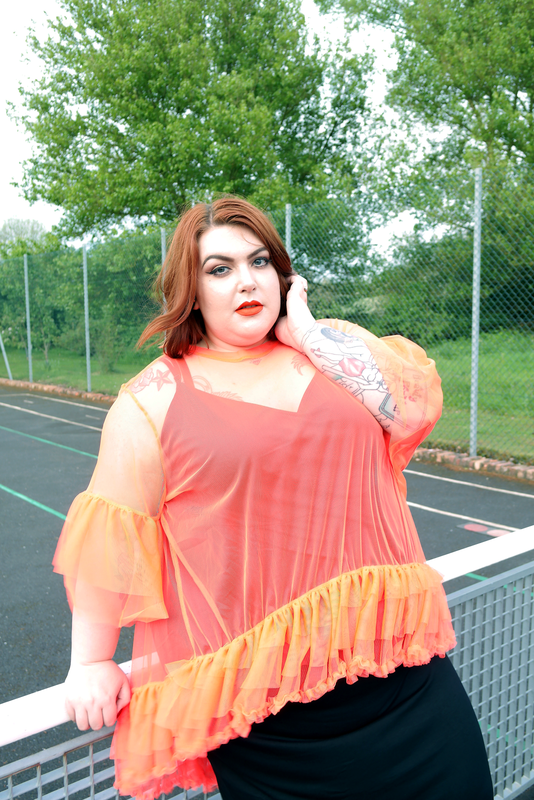 You can imagine my joy then when I spotted this Mesh T Shirt with Dipped Back and Ruffles (£25.00) on ASOS Curve - finally a thinner fabric to give a more flouncy romantic feel, but even better in a very unexpected shade of hi vis orange! I won't lie, I didn't know if it would work with my hair but I ended up loving it and decided to go all out with my fave bright orange lippy too - Kat Von D Everlasting Liquid Lipstick in shade A-Go-Go (£17.00)! My first thought for putting together the outfit was to grab some cute ripped jeans and a cami which seemed like the obvious choice, but on my bigger on the bottom frame it just didn't work with the ruffles and so I routed around and found this Cami Midi Bodycon Dress from ASOS (£12.00) and it worked perfectly, providing a striking contrast for the orange and a plain canvas to really show off the frills! This tee is very oversized and I ordered it in my regular size, but could easily have sized down. I like how the back is even more drapey and frothy with the oversized fit and I think I'll be getting a lot of wear out of this over the summer. I'm already trying to find a plain black jumpsuit to try underneath! Photos in this post are by my lovely little sis Laura Whittington!